Home Rabbits Rabbit food – What is best to feed your rabbit? Diet is so important when it comes to feeding any animal, but it is particularly important when it comes to rabbit food. By feeding a diet that is not appropriate it can lead to many health problems. Here are the most important points when discussing rabbit food to keep your rabbit both happy and healthy. In the wild rabbits will eat mainly grass. Grass is high in fibre and this is important for both gut health and to keep their teeth healthy too. Therfore, ideally fresh grass should make up the majority of the diet. When fresh grass is not available then good quality hay is the best substitute. Hay or grass should account for between 80-85% of the diet. Wild rabbits will also from time to time when they can eat vegetables as well. A variety of mixed vegetables should make up about 10-15% of your rabbits diet. 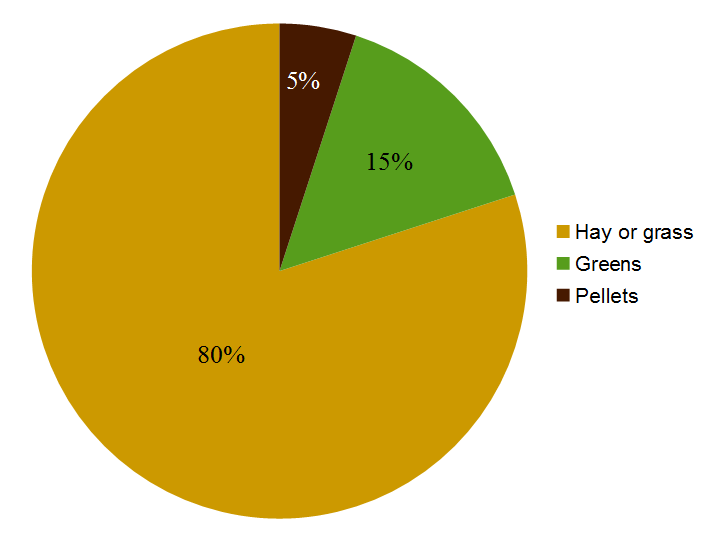 Pellets and fruit should make up the remaining 5%. Although adult rabbits with a good variety of greens and vegetables this 5% of treats and pellets can be missed out. The main rabbit food you need to buy is hay. Hay is important and some rabbits can be very fussy with what hay they may eat. Timothy hay is ideal. Avoid alfalfa hay in adult rabbits because it is high in protein and calcium. Every day you should give your rabbits access to an unlimited amount of hay. Hay is high in fibre, has moderate protein and is low in sugar. The hay needs to be ground down to digest because of its high fibre content. This grinding is achieved using the rabbits teeth and this helps to maintain good dental health. For more information on rabbit dental disease click here. Good quality hay should be free from mould, dry and sweet smelling. Remember if your rabbit will not eat the hay you have, then try a different one. When it comes to the fresh vegetables go green! Greens should make up about 10-15% of the diet; a 2.5kg rabbit would require about 250g per day. The main aim is variety, with small portions of any one plant. Fruits, carrots and other high sugar vegetables should be seen as treats and only given in small amounts once or twice per week at most. Some recommended greens include: broccoli, basil, dark green cabbage, kale, carrot greens, spinach, rocket, coriander, fennel, courgette, pepper, mint, parsley and watercress. You can also get some from your garden such as dandelion leaves, apple tree leaves and twigs, raspberry leaves, rose leaves and flowers, willow leaves and echinacia. For a fuller list click here. When you think of rabbit food then the muesli mixes are likely to come to mind first. 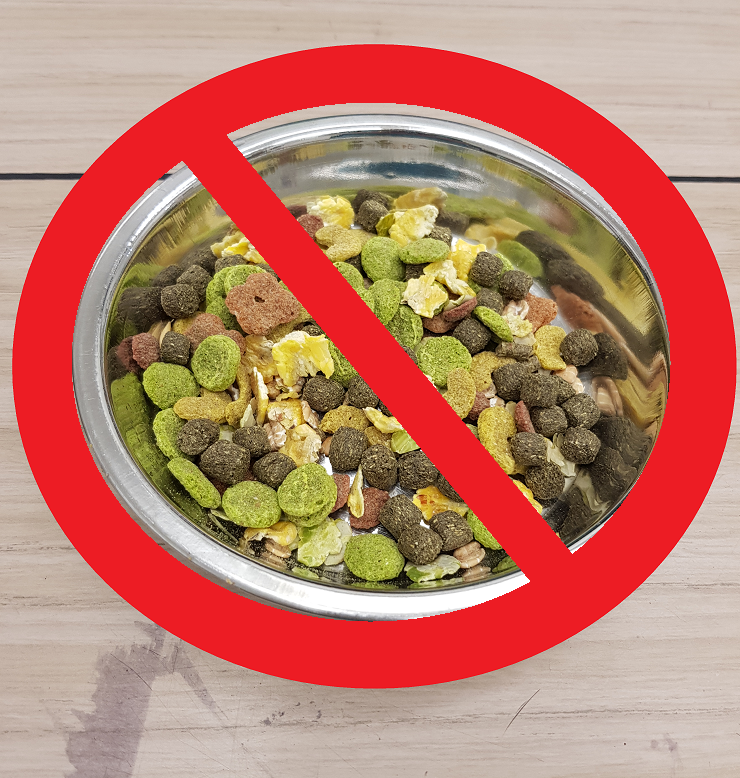 These mixes often lead to selective feeding with your rabbit picking out their favourite parts and not always eating a healthy mix. In fact one study has shown a link with muesli diet to life threatening dental and intestinal disease, click here to read more. Instead of muesli we recommend pellets. These are bite sized nuggets that have the same nutrition in each bite. Although as stated above they should only make up no more than 5% of the diet. No more than 60g of pellets per day is recommend for an average 2.5kg rabbit. Other treats should be given sparingly, especially if they are high in sugar. High sugar intake can lead to a dangerous shift in the normal flora of your rabbits intestines. There are also a few ways to make sure what your feeding is safe. Wash all greens thoroughly before giving them to your rabbit, especially if they are from the wild. Do not feed lawn clippings as they can quickly ferment and become harmful. Also check your gardens for any poisonous plants, if you are unsure then click here for more information. Why is a good diet so important? A good well balanced diet with plenty of hay will reduce the risks of your rabbit developing obesity, dental disease and gut problems, which can be life threatening. Getting your rabbits diet right from the start will set them up to have a good and healthy life. Whenever you are changing your rabbits diet it should be done gradually over a period of 1-2 weeks. This means that the natural fermenting bacteria that live in the intestines can adapt and they can maintain a normal digestive system. For more information visit the RWAF website.